The Seahawks are only one game away from becoming, by one measure, the least-effective running team in the era of the 16-game schedule, which dates to 1978. The Seahawks twice had opportunities to put rushing touchdowns on the board Sunday in Dallas, once near the end of the second quarter and again early in the fourth. Both plays failed. Neither had a material effect on the outcome, a 21-12 Seattle victory, but it pushed the franchise closer to an NFL-record feat of run-game dubiousness. With a first down at the Dallas one-yard line with 1:58 remaining before intermission, QB Russell Wilson attempted to hand the ball to RB Mike Davis. But the exchange went poorly, the ball squirted out and Wilson managed to recover the fumble in the ensuing scrum. After a timeout by Dallas, Wilson tossed a three-yard TD to TE Jimmy Graham, giving Seattle a 7-6 lead. With 12:40 remaining in the game, Seattle faced first-and-goal at the Dallas one. 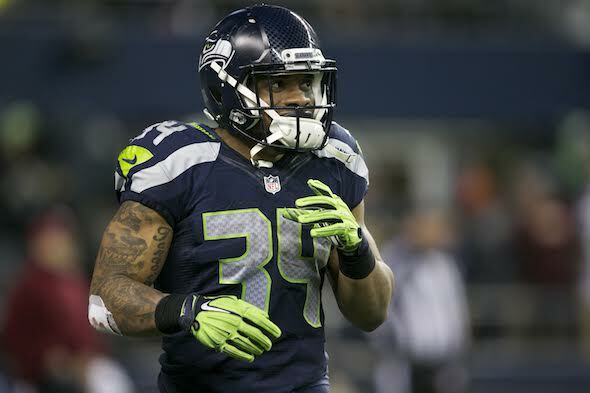 Making a rare, late-season appearance, RB Thomas Rawls was tossed for a five-yard loss. Abandoning the run, on the next play Wilson threw a six-yard TD to WR Doug Baldwin. Underscoring their biggest offensive problem, the Seahawks have a mere four rushing touchdowns, three by Wilson. The only rushing TD produced by a running back came Oct. 1 against Indianapolis when rookie J.D. McKissic tallied on a 30-yard run in a 46-18 win. Given its stunning singularity, that may turn out to be the offensive highlight of the 2017 season. Since the NFL adopted the 16-game schedule in 1978, 28 teams have finished a season with four or fewer rushing touchdowns, so this Seattle team is hardly unique in that respect. In fact, two teams, the 1995 Jets (3-13 under Rich Kotite) and the 2005 Cardinals (5-11 under Dennis Green) scored two rushing touchdowns. Seven other clubs have tallied three. So Seattle’s four doesn’t look quite so bad. Except . . . If you subtract Wilson’s three TDs, Seahawks backs are left with only one rushing TD. If they fail to improve that number next Sunday against Arizona, Seattle will be the only team in the past 40 years to get just one seasonal TD out of a running back. Before this season, Seahawks had five or fewer rushing TDs in a season three times: 1992 (4), 1989 (5) and 1999 (5). The 1989 team had all five from running backs, Curt Warner (3), John L. Williams (1) and Derrick Fenner (1). The 1999 team had all from RB Ricky Watters. The 1992 team, which finished a franchise-worst 2-14, had three from Chris Warren and one from Williams. Seattle won at Dallas Sunday despite accumulating more penalty yards (142) than total yards (136), the first time such a bizarre development has occurred in the NFL since Nov. 6, 1966 when the Eagles defeated Dallas 24-23 with 80 total yards and 89 penalty yards. The Eagles prevailed largely on the basis of two kickoff return TDs by Timmy Brown covering 93 and 90 yards. When CB Justin Coleman victimized QB Dak Prescott for a pick six Sunday, a play that gave Seattle a 14-9 lead in the third quarter, he became only the second player in franchise history to score an eventual game-winning TD on an INT return with Seattle trailing in the second half. LB Lofa Tutupu also did it against Carolina Dec. 5, 2010 (Seahawks trailed 14-10 in third, went ahead 17-14 on Tatupu’s pick, and won 31-14). Coleman is only the 10th player in franchise history with two pick sixes in a season (also 28 yards vs. Indianapolis Oct. 1) and the first to accomplish the feat since LB Bruce Irvin in 2014. Graham’s second-quarter touchdown made him the first NFL tight end with at least 10 scoring catches in a season for two franchises. Graham did it three times with New Orleans and has 69 career TDs. Pete and John will have to straighten the whole thing out for next season, but an overabundance of injuries have crippled more than one coaches career . . . Careful. You’re being too reasonable. Can John Schneider fit inside that T-shirt? He bought the groceries. Cable cooked the meal. Isn’t Cable paid to come up with the shopping list? I’ve been wondering just how much the problems at RB can be attributed to the departure of former RBs coach Sherman Smith? Both Lacy and Rawls really should be playing much better than they have been. The team has used six RBs this season with mixed results. They’ve cut two (Spencer Ware last season; Alex Collins this season) who have experienced much more success with their new teams than here. As much maligned the offensive line has been the last thing to do is to blow it up. They need to be allowed to grow and become familiar with each other. That’s their biggest weakness right now. Losing Fant in preseason hurt but led to us eventually signing Brown. I like the comment on another thread that suggests we keep Brown at LT and move Fant to RT next season. Ifedi, if we keep him, could move inside to RG (or LG, depending on whether or not they resign Joekel). Plug in Pocic at the other guard spot (if they let Joekel go) and keep Britt at Center and then let them gel together as a unit and …. it could end up being a pretty solid line. And if the team isn’t sold on Ifedi or Pocic (or just wants some insurance / development players for future seasons), they can always take a highly-rated O-lineman early in the draft (but I don’t think anyone believes they will). The keys – at least for me – are whether we can resign Brown (and maybe Joekel) to team-friendly deals and whether or not Fant is back to full-strength and ready to take the step forward that we all expected of him this year. Shore up the line, teach the RBs to trust the line, cut Lacy (never liked that signing), and MAYBE look for some more RB gold late in the draft and we should be okay. Rawls has struggled this season but outplayed Lynch as a rookie. Prosise has potential if he can stay healthy. McKissick is super exciting when he gets the ball. Carson was a ROY candidate before he got hurt. And Davis … dayum, they had this guy on their practice squad most of the year. The running game is truly awful this season but even without wholesale changes, the pieces are there for a turnaround.